Today is my 'use it up' day! I sold and gave away a lot of things we owned when I knew we'd be selling our home and moving to a tiny place (less than 300 sq. ft). Most likely, we'll be here until next Spring if not longer so I'm still evaluating all that we moved in light of an upcoming move. One of the items I did drag along were 2 HUGE plastic tubs of material. I promised myself that if I didn't make use of the material while living here that I wouldn't move it to our next home. Considering our current financial situation I'm looking for ways to use up what I have on hand. Obviously, my quilt will not look like this one. 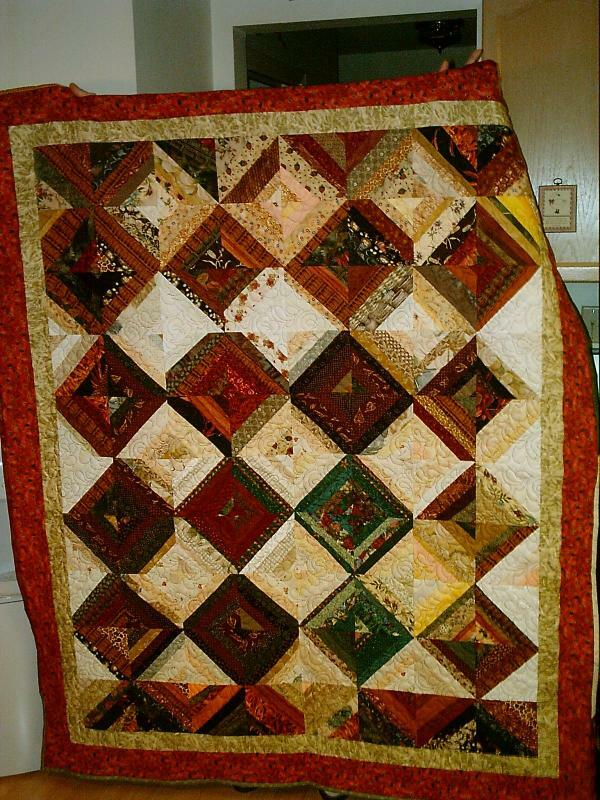 But, I do have quite a few darker colors so I'm hopeful that I can produce a quilt that may be similar. My plan is to make each of the grandchildren a quilt when they turn 13. We'll see how that goes! The 'use it up' philosophy can be applied all throughout our home. I had a small baggie size of turkey meat in the freezer that needed to be 'used up' so I made a stir fry with green peppers, onions and carrots and added a small amount of oyster sauce and sesame oil. I'm determined to use up the meat in the freezer before I purchase anymore. How many times do we purchase a 'new' product when we have several products at home that will do the same job? We just don't 'like' the product at home or we're bored with it and want to try something new. Sometimes I used to think I'd be more motivated if I had some new cleaning product to try. But, much to my shame, I had several products on my shelves that would do a similar job. I was so wasteful! Do you have ways you 'use it up' before purchasing a new item? I defrosted my freezer last weekend and am starting to cook up whatever is oldest before buying any more meats. My husband is helping. This evening he cooked turkey bacon for sandwiches. Yesterday I roasted a turkey I got free at Thanksgiving time. I had two and the first one was terribly dry. This one was too, even though I tried a different way to cook it. Just bad birds. So, I have cleaned the carcass and am using it to supplement our German Shepherd's food. We buy cheap dog food so we give him scraps to make sure he has enough nutrition for large growing pup. I did the same thing last month. I made a list of everything in my freezer and then posted it on the outside door. I also put the shelf number next to each item so I could find it quickly. I can see that I'll need to do this regularly. My mom made a scrap quilt for each of her grandchildren. I can tell you that everywhere they travel, those quilts go with them! And they have fun saying, I remember when we had those curtains or when you wore that dress. Go for it! You will enjoy it and so will the recipients of the quilt. 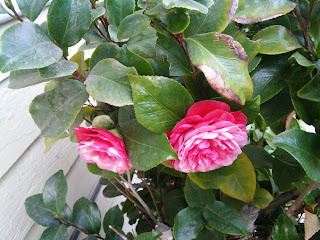 i love reading this blog ~ so many encouraging ideas. i, too, try and "shop at home" especially in the grocery area. i have bought no meat except chicken and the occasional bacon or sausage for probably a year as we had gotten a half pig and quarter cow some time ago. Sometimes i do very well at using it up around the house and then i might go on a binge (as i did last week) and buy a bunch of needless things ( like 6 magazines! :-0 ), but i keep trying. We downsized before we moved here too, a few times in our various moves. Now that we have a bigger house I started to re-accumulate some things--mainly canning and dehydrating things. But seasons bring change too, and I find I do not use my many of my embroidery supplies anymore--so I am going to be selling my collection of books and probably my linen too. I will hang on to thread because I use it in another way. Some of what I got rid of in past moves I later regretted, but usually it was the best thing to reduce. I'm all about using what I have if possible! We live on a tight budget too like so many. I have a few small things that I splurge on now and then, but in general, I try to make do with what we already have. Georgene, I used to read your other blogs - it was so nice to find you again. I like your new blog. I'm with you on the fabric thing. 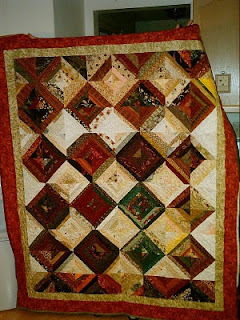 Have you ever made the 'raggedy' quilts? They are so easy, and you could use any fabric print, color, etc. that you want. I find them to be very easy. I try to use up small items of food also-- tonight I used some brocoli that was not so special looking in a casserole--it was fine.